Size Name: 10-foot by 14-foot 11014 Size: 10' x 14' Features: -Tarpaulin. -High strength rust resistantgrommets on each corner and approximately every 3 feet. -Reversible, 0.19''.-Color: Brown and green. Generic Specifications: -10 x 8 Cross weave. 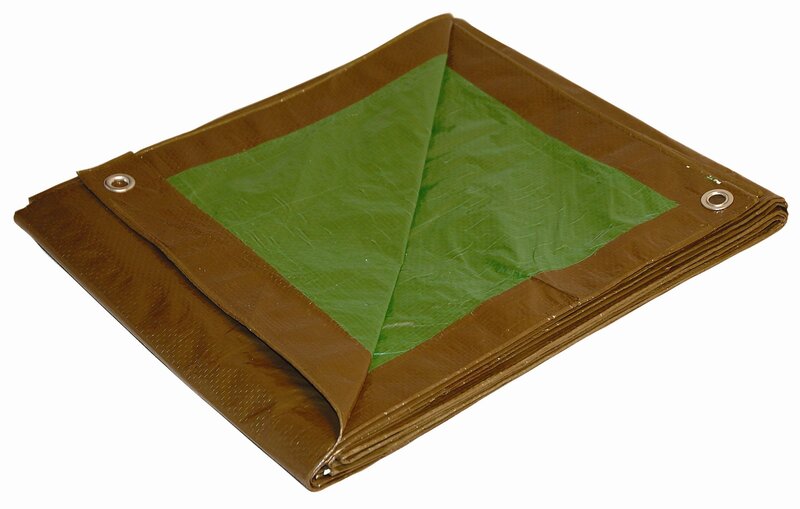 GenericDimensions: -96-288" W x 144-432" D. From the Manufacturer This Brown/Green Reversible polyethylene tarp is a full finished size opposedto other "cut size" tarps. The heavy duty industrial polyethylene material is2.9oz/sq.yrd, 10 by 8 cross weave, and laminated on both sides for maximumweatherproofing and tear resistance. High strength rust-resistant grommets oneach corner and approx. every 3 feet around the perimeter along with a ropereinforced hem add to this tarps long lasting durability. This is a greatmulti-purpose tarp that can be used around the house and/or work place.